Let me start out by saying that I don’t particularly enjoy books about pirates. Needless to say, Jim Morgan and the Pirates of the Black Skull wasn’t my type of book, but it is an Advanced Reader Copy and I felt compelled to read it. 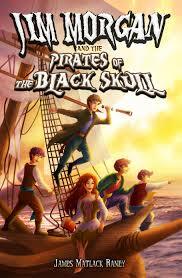 If you enjoy pirate tales, Jim Morgan is a book that will keep you on your toes. Action packed and fun-filled, this book is sure to make you want more. Jim Morgan has just recovered from his escape from London. He is now heading home to Morgan Manor, but just as he reaches, a terrible fire burns his house down. Jim starts having terrible dreams about a crimson storm, and when the Count, his old enemy shows up, it’s up to Jim to save the day. Jim and his friends board a ship to find the lost treasure before the Count and his son do, but later get into a fight. Jim unleashes dark magic to help them win the battle, but even magic comes at a price.